So you’re building a home gym. You’ve got your power rack. Now all you need is some serious weight to move around! How much should you set aside in your budget, though, for a good set of plates? How much do gym weights and Olympic plates cost on average? You can expect to pay around $1.50 to $2.00 per pound of Olympic weights for your gym. Smaller weights will be pricier per pound, with 2.5 pounders running you anywhere from $5-16. Heavier weights will often cost less per pound — a 45-pound plate should cost anywhere from $45-80. Remember that these are only estimates. There are many, many other factors involved in the price of weights, so let’s take a closer look. 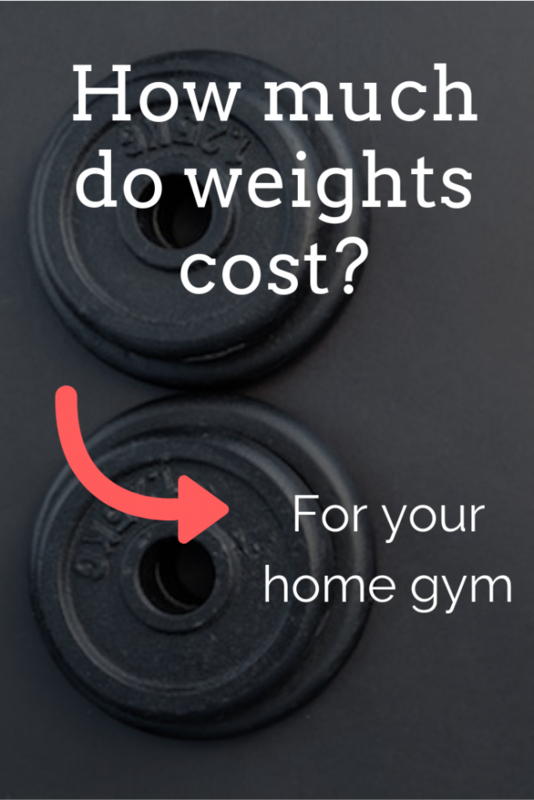 What affects the price & cost of gym weights? So the general range you should expect to pay when buying weights for your home gym is around $1.50 to $2.00 per pound. But certain weights can be way more or way less than that! What are the different things that might affect cost? In general, you often get what you pay for. Meaning more expensive weights will typically be of a higher quality and be more durable over time. Though you don’t want to get caught up simply paying for a brand name, either. Here are some things to look at while you shop. A large majority of 2″ Olympic-style weight plates are made of cast iron. They’re thick, heavy, and incredibly durable. However, some models and brands of these weights will coat the plates in rubber after they’ve been formed in iron. Typically, rubber-coated cast iron plates will cost a little bit more than plain cast iron. Some weighted plates are just solid cast iron with a 2-inch hole in the middle. Others have a unique form to them, often with cutouts near the edges that not only look cool but give you extra places to grip the weight. It’s unclear if grip holes directly impact the price of weights, but it does seem that a lot of the nicer and more expensive models have them. Moreso than a price driver, grip holes are something you should think about before you buy. 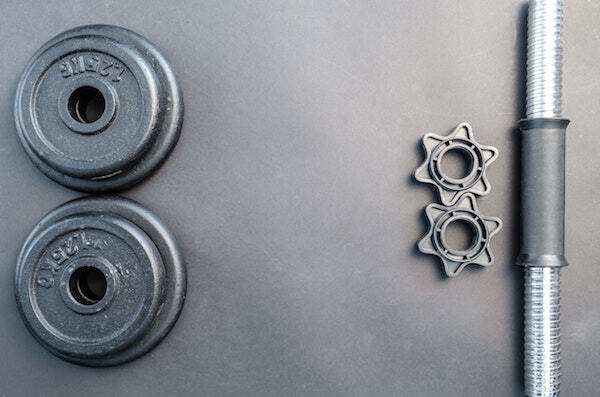 They have a lot of advantages, but some people prefer the classic look of solid Olympic weights. This is not something you’d probably think about unless you experienced it firsthand. After all, the weights at the gym have been in use for years, most likely, and are well-worn at this point. But brand new rubber-coated Olympic plates can SMELL. It doesn’t sound like a big deal, but just wait until you have a brand new set of stinky weights in a confined basement or garage gym. This is usually due to lower quality materials. If you want to avoid that yucky new-weight smell, you may want to read reviews carefully and spring for a higher-quality product. Cheaper weights are often more poorly calibrated when it comes to how much they actually, you know, weigh. A 45-pound plate, for example, can easily be off by a few pounds in either direction. For casual, recreational lifters, this isn’t ideal at all, but it might not be a deal breaker. If you’re training for a very specific goal or for competition, getting improperly calibrated and inaccurate weights could totally throw off your training. If you’re an athlete training for competition, definitely consider springing for higher-end weights. Even if you’re just a novice or casual lifter, think twice before cheaping out too badly. Let’s take a look at some real-life, concrete examples. Below are a handful of Olympic weights (singles and various different sized sets) that should illustrate how the pricing generally works. The prices listed are the most current MSRP I could find, or close to it – give or take a few dollars. These are ESTIMATES and don’t reflect the actual price at any given retailer. You can very often get a better deal on Amazon (I’ll provide a few specific recommendations in the next sections). Remember, these are ONLY estimates within a few dollars or so. You can see there’s a lot of inconsistency. Sometimes one brand is the cheapest option, but for different weights or styles, it might be a different scenario. Your best bet is to pick a budget, decide on the features you need, and then shop accordingly. I really like most of what CAP Barbell has to offer. They’re a solid and well-trusted brand and they’re typically one of the most ubiquitous, easily-available, and affordable options around. If you’re looking to get a lot of weight on the cheap, grab their 300-pound set with their budget quality black grip plates on Amazon. It’s really hard to beat that package on price and overall quality. Some reviewers noted the weights suffer from some minor inconsistencies and calibration issues, but that the set is pretty much the cheapest way around to get a lot of weight at once for your home gym. What are the best gym weights for the money? If you’re interested in getting a little more bang for a little more buck, I’d recommend shelling out just a little more for the CAP Barbell rubber coated 300lb set on Amazon. and protect your weights and other equipment over time. It’s worth an extra hundred dollars or so. Plus, this set uses slightly higher quality plates that are better calibrated and have fewer inconsistencies between them. If you’re looking for the absolute best of the best, and you need perfectly calibrated weights for training purposes, go with Rogue competition-level plates. How much do bumper plates cost? One of the biggest benefits of bumper plates is that you can drop them from over your head directly onto the floor, and they’ll simply bounce and come to a gentle stop. Bumper plates are usually made of dense, compact rubber around a steel core. Bumper plates and Crossfit plates are usually significantly more expensive than standard Olympic plates. Expect to pay between $2.00 and $3.00 per pound for these specialized weights, and sometimes much more. How much do used weights cost? Should you buy used gym weights? Buying used Olympic plates is a great idea. They typically hold up well for a very long time, even after rigorous use. If you can deal with a few scuffs and scratches from used weights, you can get an awesome deal. If you’re a good bargain hunter and negotiator, you should be able to get used plates for anywhere between 25 cents and 75 cents per pound. That’s the benefit of people thinking they’re going to use equipment and then never getting around to it. Missing weights from a set: If you’re buying a full set, ensure it’s all there before forking over the cash. Make sure every weight advertised is accounted for and there’s no off-brand substitutions. Rusted weights: If the weights are overly rusty, they should still be fine to use. But use that in your negotiations. Get yourself a great deal and you can clean the weights off later with a few chemicals! If you’re buying weights for your home gym, you’ll often get what you pay for. You can pay on the lower end of the spectrum ($1.00 to $1.50 per pound or so) for cheaper plates that may be less durable and poorly calibrated. Or you can pay on the high-end for something a little better. Either way may be fine depending on your needs and budget! Even still, you always have the option of buying competition-level, perfectly calibrated plates if that’s what your training requires. 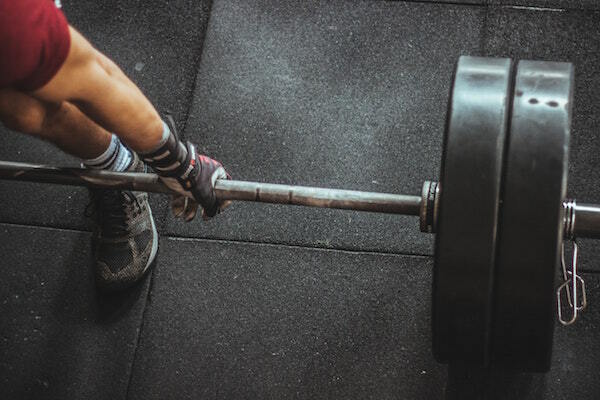 Your best bet will often be to buy a set or package that includes somewhere around 300lbs of weights and an Olympic bar, then supplement with additional single or paired plates as needed. 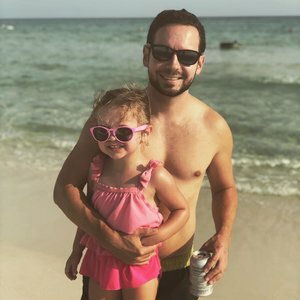 Hope this helps you as you shop, best of luck to you building the home gym of your dreams! How long does it take to bench 225+? Is it impressive?